Hey friends! I am back after a break. Actually I was busy in some projects and college issues. But from now on you will read my posts regularly. I will again try to update this blog of mine with valuable info about Cydia apps and cool tricks to do with your iOS device. Here I am sharing with you a very useful Cydia app named AppAddict and how to install AppAddict from Cydia to your iOS device. You might have heard of it before. If not, then allow me to enlighten you. AppAddict is a cool alternative for Installous, vShare, Panda App, iFunbox, Appcake etc. After installing AppAddict from Cydia to your iOS you will be able to download iPA files, free apps, cracked apps, wallpapers, music and much more for free. AppAddict is like Apptrackr. If you have used Apptrackr earlier then you will find if very similar to AppAddict. AppAddict is just like Apptrackr but with advanced features and more download variety. Here are some simple steps that you need to follow to install AppAddict to your iPhone. One thing you need to know that is AppAddict works for jailbroken iOS device. Hence you need to jailbreak your iPhone/iPad before downloading AppAddict. And since we are using Cydia for downloading you need to install Cydia on your iPhone too. You can see this tutorial to jailbreak your iPhone - jailbreak iOS 8 using TaiG. Here are the simple steps that you can use to install AppAddict on iOS 7, iOS 8.1, iOS 8.2, iOS 8.3, iOS 8.4 or even higher. Make sure your iOS device is jailbroken and you have iOS 7 or iOS 8 installed on your iOS device. Step 1 - Tap on Cydia icon on your homescreen and open it. You will land over the homepage of Cydia with the message "Welcome To Cydia". Step 2 - From here go to Sources. Now you will see a "Edit" button the top right corner. Tap on it and then tap on "Add" button. Step 3 - A pop up dialog box appears with the asking you to enter Cydia/APT URL. This URL is the Cydia repo you have to enter to install AppAddict from it. You can use any of this repo but I will advice you to go with he official repo of AppAddict i.e "http://appaddict.org/repo". So in the box enter the Cydia/APT URL as "http://appaddict.org/repo". Step 4 - Once you have added the repo then move again to Cydia -> Sources and then select the AppAddict repo you have just added. Step 5 - Tap the "Search" option and search for "AppAddict 4"or the newest version that is compatible with your iOS. Now tap on the "install" button in the top right corner and wait. Congratulations! You have now successfully installed AppAddict on your iPhone/iPad. Now use this quality Cydia app to download more free apps, cracked apps, IPA files and whatever you get. What If AppAddict Is Not Working? Fortunately you might be successful in downloading AppAddict on your iOS device but unfortunately it could be possible that AppAddict may not work. Let us see what could be the reasons that AppAddict is not working. Reason 1 - This is the common mistake most of the users make. They forget to install Appsync. Yes my friends "Appsync". Appsync is a Cydia tweak that signs the cracked app so that hey could run on iOS device. 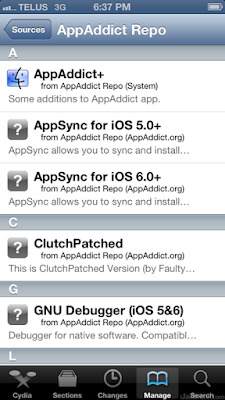 So if you have not installed Appsync yet, download it to run cracked apps on your iPhone. Here is the tutorial on how to add Appsync Unified from Cydia to iOS 8. Reason 2 - You might have downloaded the wrong version of AppAddict that is not compatible with your iOS version. So just again if your AppAddict version is compatible with your iOS version. Reason 3 - You lose the internet connectivity while adding the AppAddict repo. Reason 4 - You have not jailbroken your iOS device. These could be the possible reasons why AppAddict might not work on your iOS device. Just keep them in mind and you will not face any issues. So this was a simple guide on how to install AppAddict from Cydia to your iOS. Even after following the steps AppAddict doesn't work then you can use AppAddict alternatives such as vShare, iFunbox or Appcake.